Ainsworth Gaming's widely played Mayan Gold video slot will take you back in 2000 BC, in the Ancient Mayan civilisations. The world came to know about the Mayan people after the 2012 "End of World" hoax that circulated. They are also associated with the strange long count calendar. The Mayan people have a vast and exciting civilisation that has attracted many scholars, writers, and game developers. They are considered to be knowledgeable in spiritual and religious matters, astrology and breakthrough in mathematics. As with other Ainsworth slot games, the small betting range of between $0.01 up to $100 per line accommodates both low roller and high roller players. It set on a simple layout of 5 reels, three rows and 100 pay lines. There are symbols and special features to boost the chances of winning. Mayan Gold slot is playable across all major devices including smartphones and tablets. If you are looking for a slot that will offer you the typical Mayan architecture, then you have made the right choice. Upon loading, you will be welcomed by stunning 3D graphics and visual animations. The reels are set against an ancient golden Mayan Temple which is surrounded by fire. The characters used in the game like the golden pyramid, mask, exotic birds, gem and flowers match with the theme to give an impressive and attractive look. You will enjoy trotting sound effects as you spin, but there is an option to mute. 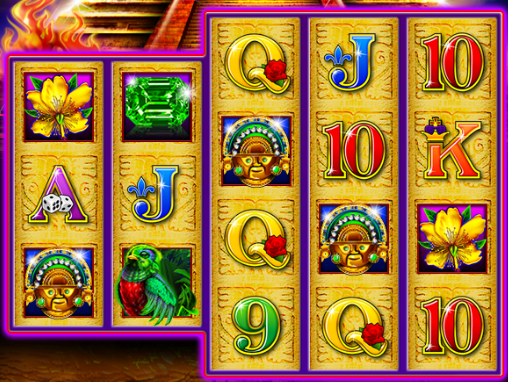 The logic in Mayan Gold slot is slightly different from other video slots in the way that the first two reels have three rows while the last three consists of four rows. However, this should not intimidate you because they boost your chances of winning. The 100 fixed pay line will reward from the leftmost to the rightmost. Before you get immersed in the mysterious Mayan culture, it is essential to set your bet. The game settings are embedded in the Cog icon. Clicking on this icon will allow you to adjust the bet value as well as the number of lines. Another vital function is represented by "i", click here to learn how to play and how the base paytable works. The Spin button is located in the bottom right corner while the Autoplay setting (represented by +) lets you play 100 spins without interference. The symbols you will find in Mayan Gold are not different from other titles with the same theme. There are 15 different symbols comprising of low value and high value. The high paying symbols are represented by the golden pyramid, exotic birds, mask, gems, and flower while the low-value icons are traditional card symbols marked by J, Q, K, A, 9, and 10. The Golden Pyramid is the highest paying symbol; it offers a payout of $0.2 and $0.05 for appearing 4 or 3 times respectively. The Exotic Birds have the second highest payout 0.5 coins for appearing five times. The other symbols have their payout indicated on the base paytable. The wild symbol substitutes for all other symbols in the game except for the Dollar Wild and the Whopper Wild. This symbols will only appear on reels 2, 3, 4 and 5 during the paid game. The Whopper wild will showcase on reel 3 where it will substitute for all other scatter symbols with the dollar wilds. There are two scatter symbols in Mayan Gold slot. The first scatter is represented by the normal Dollar sign and rewards 100 credit coins for landing 5 on the reels. The Dollar Wild symbol marks the scatter symbol, and it comes with its Wild formations which reward accordingly. When 3 or more regular scatter symbols appear, you will be rewarded with 8 free games. Other special symbols like the Grasshopper Wilds and Whopper Multiplier are applicable during the free games round. 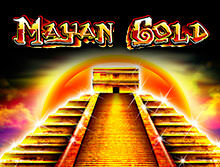 Just like other titles from this developer, Mayan Gold slot is created with cutting edge technology including HTML5. This enables the game to retain stunning graphics and flawless gameplay on smartphones and tablets. There is no need for software because this slot can be played instantly through any mobile browsers like Chrome, Safari, Firefox and Opera Mini. Since 2013, Ainsworth Gaming Technology has been supplying the online casino market with impressive slots games. The Australian based company started as a provider for land-based slots machines but later embraced the modern trends. Although the slots catalogue is not that big, you will enjoy playing all games on your iOS and Android-powered devices as well as from your desktops. The slots games can be played for fun or real money at any reputable online casino site anywhere in the world. One thing that sets Ainsworth Gaming's slots from others is the high payouts which are equivalent to jackpots. Play Mayan Gold video slot and many other exciting titles from Ainsworth Gaming Technology here at bCasino. We joined the online market at the beginning of 2018, but we have achieved more than our peers. Our vast game collection is supplied by some of the best-known developers in the iGaming industry like NetEnt, Playtech, Best of, NextGen Gaming and Evolution Gaming among others. We adhere to all the online gambling rules under the UK Gambling Commission and employ advanced security technology like Secure Socket Layer (SSL) encryption software to ensure that our customer's transactions and sensitive information are safe. We have a decent bonus reward program where all our new players get a match bonus of up to $1200 plus 100 free slots after the first deposit. We understand the value of communication, which is why we have committed support agents available via email and live chat to answer all your questions 24/7.